If you have skinny legs, it can be extremely difficult to find a good fitting pair of tall boots. Often they’re too wide for your leg and don’t look or fit right. Thankfully, narrow calf boots exist! It can be a bit tricky to find them since not all brands offer them, but when you find a pair you love, you should buy them in every color possible. When you’re looking for a pair of narrow calf boots you are going to need to spend a decent amount of money. That’s why you want to be sure that you choose the best pair. So, what exactly should you be looking for in the best narrow calf boots? Well, aside from checking to make sure that a pair of narrow calf boots fit in your budget, you will also want to be sure that your calf will actually fit! In addition to that, you should look to make sure that they are comfortable, that they fit well with no pinching or slipping of your foot, and obviously, they should be fashionable. Quality materials like leather and stable zippers will ensure that your narrow calf boots will last several seasons, which is good when you’re spending a lot of money on them. Now that you know what to look for in the best narrow calf boots, how do you choose the one that is right for you? With hundreds of brands and models on the market, the search can feel overwhelming. Thankfully, we’ve done the hard work for you and tracked down the top5 narrow calf boots for skinny legs. If you are looking for the best pair of narrow calf boots, the FRYE Women’s Jayden Button Tall Riding Boot is one of the best available. Not only are these boots narrow calf and extremely stylish, but they are also very well built. Made from a smooth vintage leather that offers high and low tones due to the hand-burnishing, these riding boots have a streamlined silhouette that makes them perfect for women with thinner legs. The inside zipper makes it easy to slip the boots on and off, as does the additional side pull tab. You might not think boots that look this good can also feel good, but the FRYE Women’s Jayden Button Tall Riding Boot defies that logic. Not only are they fashionable, but they’re also extremely comfortable. That is made possible by the soft leather lining that provides soft comfort. In addition, the foot bed is cushioned lightly with leather for additional support and comfort. Plus, the FRYE Women’s Jayden Button Tall Riding Boot comes with a leather outsole and rubber heel that provides great traction. In addition, the FRYE Women’s Jayden Button Tall Riding Boot comes in two different colors, brown and black, so you can pick up the one that fits your preference, or both! The FRYE Women’s Jayden Button Tall Riding Boot is a bit on the expensive side, but you will be hard pressed to find a better pair of narrow calf boots on the market. For another option during your hunt for the best narrow calf boots, the La Canadienne Women’s Passion Boot is another boot to consider. Right off the bat, you will need to acknowledge the hefty price tag that comes with these boots and determine if they will, in fact, fit your budget. If these narrow calf boots are something you can afford, they’re certainly worth consideration. Coming in three options, black leather, black suede, and espresso suede, the La Canadienne Women’s Passion Boot is the definition of fashion. These sleek boots are made with waterproof leather and suede uppers so they can be worn year round, and are made with the highest quality Italian components from heel to toe. In addition to looking fashionable, the La Canadienne Women’s Passion Boot also feels great on your foot. That is because there is a breathable and moisture wicking microfiber lining that keeps your feet dry and comfortable. In addition, there is also a memory foam insole for great support and cushioning. Plus, the inside zipper and stretch fit combine to make the La Canadienne Women’s Passion Boot a great fitting narrow calf boot no matter your exact measurements. If you want a stylish and comfortable pair of narrow calf boots that are built to last, and don’t mind paying more for it, the La Canadienne Women’s Passion Boot should definitely be on your list to consider. Now some women want a narrow calf boot that comes with a bit of a heel. If that is what you are looking for, then the Söfft Women’s Wheaton is the boot that you need to consider. Though they come with a slightly higher price tag, you’ll also get the higher heel that you’re looking for. The Söfft Women’s Wheaton is simply a high heeled version of their bestselling boot the Sharnell and is crafted in premium leather before being hand finished. The stunning beauty really shines through in these brown “whiskey” color boots and you can rest assured that you’ll be gathering compliments wherever you go in the Söfft Women’s Wheaton. In addition to looking great, the Söfft Women’s Wheaton is also extremely comfortable. 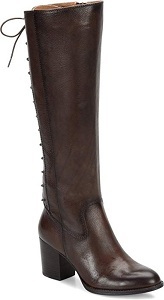 Part of that is due to the fact that these boots come with an adjustable shaft lacing feature. This stylish, but functional feature means that you can adjust the calf of the boot to fit exactly the way you want it. That’s not where the comfort ends, either. The Söfft Women’s Wheaton also features a microfiber lining and leather lined foot bed that has added cushioning for enhanced comfort. If you want a well-made, high-heeled boot for thin calves, the Söfft Women’s Wheaton is definitely worth the consideration. No matter what they’re paired with, a skirt or some fashionable denim jeans, the Dansko Women’s Lorna Boot is one of the best narrow calf boots for many reasons. These boots are great for causal events and are made with a quality leather upper that is durable and malleable to allow for natural foot movement. That’s great considering some other boots on the market are more rigid and can causes blisters and pain while you wear them. The Dansko Women’s Lorna Boot also comes with a steel shank for added support. Not only are these black boots extremely stylish, but they’re also designed with your comfort in mind. If you don’t believe us, just keep reading! The Dansko Women’s Lorna Boot comes with a triple density foot bed that supports you every step of the way. The foot bed is also completely removable so you can incorporate your own custom orthotics into the boot to ensure that you have all of the cushion and support you need while you are out on the town. 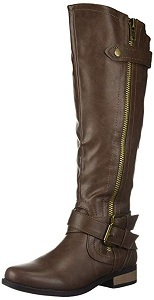 The zipper closure also ensures that it’s easy to slip in and out of the boots, which is perfect for a woman on the go! For those wanting the best narrow calf boot, the Dansko Women’s Lorna Boot is certainly a quality option, especially if you need custom orthotics. Though you’ll be hard pressed to find a narrow calf boot more expensive, you’ll also struggle to find a pair that looks as absolutely stunning as the Bed Stu Women’s Glaye Boot does. These boots come in five colors ranging from black and gray to brown and tan and are sure to wow any room that you step into while wearing them. That is because these books are all natural leather and inspired by an equestrian boot. Not only do these narrow calf boots look good, but they’re also built to last. Made from only the finest materials, these Goodyear welted boots all feature one of a kind finishes and are handmade. With individually stacked leather heels, the Bed Stu Women’s Glaye Boot is sure to impress. Style and durability are certainly important, but the Bed Stu Women’s Glaye Boot is also very comfortable. Part of that is due to the fact that Bed Stu pays attention to the details. The cushioned insole gives you the perfect combination of comfort and support, while the zipper closures along the back and side give you a secure with without causing blisters. If you want a top notch pair of boots and have the budget to afford them, the Bed Stu Women’s Glaye Boot are worth a second—and third!—look. Some women love boots that are slouchy while others prefer those without slouching materials. Nevertheless, whatever your preferences, the BCBGeneration Women’s BG Eileen Slouch Boot is sure to grab your attention. The Eileen Slouch boot is made of 100 percent suede and other imported materials, giving it a modern, sophisticated touch. Furthermore, it has a synthetic anti-skid sole that is not only durable, but also perfect for almost all types of terrain. Importantly, the shaft measures close to 17” from the arch while the boot opening is about 14 inches, making it the perfect boot for long, slim legs. Additionally, the shoe has an interior side zip closure that can be easily adjusted to fit your legs. Moreover, the heel is 4 inches long, which provides proper balance regardless of your body size. If you love gold on black, then you will definitely love the Eileen Slouch boot. These almond closed-toe boots are exactly what you need for your confidence and self-esteem. They come with conspicuous gold-tone studded straps that will make you stand out wherever you go. The metallic hardware along the elasticized shaft and the buckle located at the ankle are more than fashion accessories, as they give the boots an exquisite finish to boost your ego whenever you step out wearing them. The Naughty Monkey Women’s Stride Chelsea Boot is another shoe that has seemingly taken the fashion industry by storm, thanks to its chic, sleek design. Apparently, the designer put much thought into creating these magnificent shoes. Although they might appear simple from afar, the boots are simply gorgeous and highly sophisticated when you take a closer look. They Naught Monkey is made from 100 percent suede leather that looks and feels soft from the onset. The boot also comes with a synthetic sole that works effectively to reduce slippage when walking. However, you have to be extra careful when walking on slippery surfaces such as ice. The shaft measures about 15 inches from the arc while the boot opening is 13.5 inches around. In addition, it has an inside zip that you can adjust to fit your legs conveniently. Furthermore, it has a very low heel that measures 1.25 inches only, for maximum balance and stability. Apart from the stylish appearance and amazing aesthetic features, the Naughty Monkey boot is extremely comfortable thanks to its unquestionable quality. You wouldn’t want to acquire any other boots, once you try them on. So what are you waiting for? 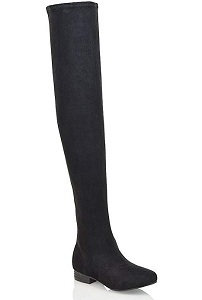 If you are looking for narrow calf boots that go all the way up to your thighs and over the knees, then consider acquiring the ESSEX GLAM Womens Thigh High Stretch Calf Leg Boots. These boots combine glam and functionality to provide you with the perfect footwear to grace casual and formal events without raising eyebrows. The ESSEX Glam womens boots are made from microfiber using highly advanced technology to deliver a top-quality finish. The boot is designed to snuggly fit your slim legs without squeezing your calves or sliding down. What is more amazing is that you can stretch the boots up slowly to fit over your pants without much struggle. Like most calf boots that we have reviewed in the past, this boot also consists of a synthetic sole that prevents slippage and reduces the risk of tripping. In addition, the heel measures 1” only, providing sufficient balance and support when walking on any type of surface. The shaft of this boot measures 26 inches from the arch ( excluding the heel), and has a circumference of 15.6 inches. In addition, the calf circumference measures 12.8 inches without stretching. Moreover, the boot comes with a half inside zip that you can adjust to fit your legs accordingly. You will certainly love the fact that it is made with an elasticated leg that can adjust to fit your slender legs appropriately. Unfortunately, ladies with big thighs or calves might struggle to fit into these shoes. Notably, the Essex Glam boot is available in a wide range of sizes from UK3/ US5 to UK9/ US11 with a wide selection of colors including black, grey, khaki and burgundy. The FRYE Madeline boot is a western style boot that is chic without being excessively flashy. Made from 100% oiled sued, the boot comes in a classic, elegant design that appeals to all ages, and is suitable for all occasions. It has a leather and rubber sole that offers a fresh break from the plastic soles, common with other types of footwear. The rubber soles are not only durable, but also versatile enough to manage different types of surfaces without slipping or skidding. Moreover, you will love the fact that the Madeline boot is wide enough to suit any type of leg while at the same time it is sufficiently narrow to fit slim calves perfectly. The shaft measures 17 inches from the arch while the opening measures 15 inches around. Furthermore, the heel measures only 3.5 inches, which is reasonable enough to offer proper body balance and support when in motion. In addition to all these amazing features, this boot is extremely comfortable. It has a lug outsole and an inside zipping for extra comfort and convenience. Furthermore, it is available in a wide range of colors that you can choose from, including black, khaki and brown, depending on your tastes and preferences. The FRYE Phillip Riding boot is yet another classy, high-quality pair of shoes worth checking out. The boots are made of 100% leather, making them perfect for every occasion. Furthermore, it comes with leather and rubber soles designed to withstand the test of time and other harsh elements. Amazingly, you can wear these shoes in both wet and dry conditions without the risk of slipping thanks to their antiskid soles. In addition to its refreshing look, this boot offers the perfect fit for tiny calves. The shaft is approximately 16 inches from the arch while the boot opening is 13.75 inches around. On the other hand, the heel is 1 inch only, meaning that you will not have any problem finding your balance when walking. Clients particularly love the Phillip Riding boot because of its classy buckles at the ankle and calf that give it an authentic, equestrian look. Furthermore, the interior zip coupled with the padded footbed allows wearers to adjust the boots accordingly for extra comfort with no break-in required. 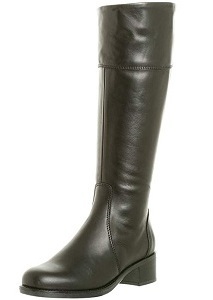 What is more amazing is that this boot does not slouch despite the fact that it consists of soft, supple leather. 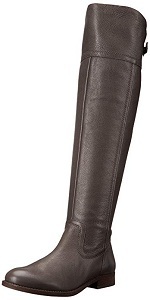 The Rampage Hansel Riding Boot is a trendy pair of shoes available at a remarkable budget-friendly price. The shoe comes with a wide range of features that offer good value for money. Firstly, this handcrafted boot is made of faux leather that looks smooth and fashionable. However, the sole is synthetic, but this does not take away the fact that the boot is somehow resistant to slippage. 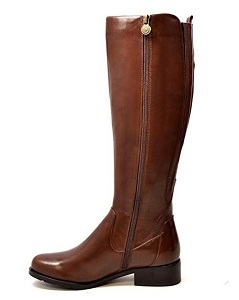 The Rampage Hansel Riding Boot is not only comfortable but also offer feel-good factor no matter the weather. It is designed to keep your feet warm during winter and dissipate heat during summer. Furthermore, the round toe provides sufficient comfort and protection for your feet. Additionally, the shaft measures about 17.25 from the arc while the boot opening is about 16.25 inches around. These measurements are ideal for women with medium to wide calves, although you can adjust the interior zip accordingly to fit your slender calves. 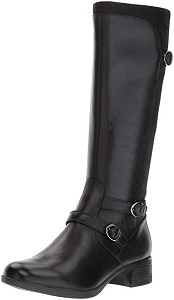 Like most knee-high riding boots, this shoe features a double buckle at the ankle and a button strap at the calf. It also comes with a full-length decorative zip for an elegant finish. Besides its amazing aesthetics, these boots are available in different colors and styles such as brown smooth, cognac smooth, taupe smooth and many others, to meet your stylish tastes and preferences. The SoleMani brand does not need any introduction. The company is widely acclaimed for producing high quality, stylish boots, and the Abigail Calf Size Leather Boots is no exception. Made out of 100% natural leather, this stylish boot is designed for ladies with slim, narrow calves. It consists of an adjustable, stretch fabric panel that can easily conform to the size of your legs without damaging the shoes. Additionally, the boot opening starts with a circumference of 12” and it can stretch up to 13” for the perfect snug fit. Moreover, this pair of boots is also available in 14” calf size for size 10, meaning the ladies with larger legs can also enjoy these classy shoes. What is more amazing is that the boots are extremely comfortable, thanks to their butter soft materials. You can wear them all day long without getting sore. Additionally, they come with rubber stacked anti-skid soles for extra grip and comfort when walking on any type of terrain. The fact that they are well-lined means that you can wear these shoes even in the rain or snow. You will certainly love these shoes once you set your eyes upon them. With all these features at your disposal, how much more can you ask for? If you are looking for classy, elegant shoes that you can wear for any occasion, then look no further than the L’Artiste boots. They are designed to augur confidence, speak volumes about your personality and give your self-esteem a major boost as you go about your daily business. L’Artiste is made using a delicate combination of leather and textile to give the shoes a unique, stylish look. The fabric shaft is patterned with ancient French embroidery that makes the shoes standout against its competitors. With a knee-high design and a well-balanced block heel, wearing these shoes will certainly make you stand out in a crowd. Besides its unique leather-textile combination, the boots come with rubber anti-skid soles that are extremely durable and ideal for all types of terrain. It also has a round toe that provides extra room for your feet. Moreover, slipping into this pair of boot is as easy as a breeze thanks to its zipper closure located conveniently on the sides. As if that is not enough, L’Artiste boots are available in different colorful designs, giving you a wide range of options as far as choosing perfect footwear to suit your style. We wind up our reviews with yet another excellent narrow calf boots. This time it is the Kaitlyn Pan Microsuede. Is it a case of saving the best for last? Let’s find out. Kaitlyn Pan Boots are highly rated shoes that are designed to last while remaining stylish in the long term. Furthermore, they are extremely easy to clean and can be worn anywhere, making them a favorite for many women. Nevertheless, the highlight of this microsuede boots is that it is manufactured using lambskin rather than traditional leather. Furthermore, the insole and the shoe lining material are extremely soft for extra comfort. With a calf circumference of 30cm and an opening circumference of 34cm, Kaitlyn Pan Boots can be worn by any lady regardless of your leg size. This is because the shaft is capable of stretching conveniently up to 39cm. Like most of the narrow calf boots in our reviews, this pair is also available in a variety of colorful designs ranging from army green to traditional black. Featuring a strong and elegant leather and textile upper, these are superior quality boots that will reliably take you from one season to another in style. They are uniquely designed motorcycle boots that have a tough and durable synthetic sole that will give you a firm grip on any surface and a size-zip that will offer you a perfect and comfortable fit. Moreover, the round toe and stretch back panel helps in ensuring ease of wear. The boots are very comfortable to wear and you can actually put them on the whole day without feeling any discomfort. 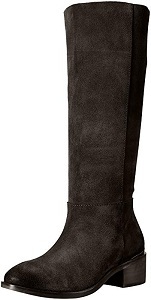 They are smart and attractive over-the-knee boots that have suede back panels and harness straps right at the ankle. Moreover, the boots are extremely versatile on that you can wear them with your skirts, leggings or skinny jeans. Another great thing about these boots is that unlike other types, they are not normally noisy when you walk around. Their shafts measure just about 19.25 inches from the arch, the heels are approximately one inch while their platform measures about 0.25. The boot opening is approximately 14 inches round while the cushioned footbeds help in enhancing your comfort while you are wearing these boots. If you are a tall girl with small calves, these are the best boots for you. They typically fit like gloves and will also look incredible on you. If you want to confidently show off your slim calf, these will no doubt be the best boots to buy. Featuring a butter-soft leather upper, the boots have been designed to offer you with a comfortable fit. Their rubber stacked soles are meant to reduce incidences of skidding so you can walk around on any surface without any fear of falling, while the side zipper help in making it easier for you to wear and remove the shoes. The shoes are perfectly cut for those ladies that have extra narrow calves. They are made with stretch or adjustable fabrics which can conform to a slender leg. In fact, the details and elastic materials at the back of the boots are able to stretch in order to create extra space on the calves. Another great thing about these boots is that they are waterproof, which means that you can wear them in the rain or to wet places without the fear of water sipping into the boots. As their name suggests, these boots have extremely slim calves with their calf sizes starting from 12 inches for size 6 and this increases with size up to 13 inches for size 10. In addition, they are also available in the slim 13 inch calf size for the size 6 boots and increase with size up to 14 inches for size 10. Their leather is ultra-soft and supple while their lining is soft and cozy. Made of 100% leather, these boots have been specially designed to give you the comfort, traction and maneuverability you need while you are walking around. They are versatile and stunning riding boots featuring a sleek over-the-knee Silhoutte and can be worn virtually anywhere. Their soft leather upper makes the boots extremely comfortable to wear and also gives them a longer lifespan. They are elegant and functional leather boots that are designed with zipper closures at their inner ankles and buckled strap details at the back. These usually help in making them easier to wear and remove as well as fastening them firmly around your legs. The shoes have a synthetic sole which will give you perfect traction across all surfaces. The boots have heels that measure about an inch, shafts that are around 21 inches from the arch and platforms that are approximately 0.25. In addition, the boot opening measures just about 15 inches round. Moreover, these boots usually come in a range of sizes, which means that you can always choose one that fits you well. They are also stiffer, clean looking and are built to last for years. 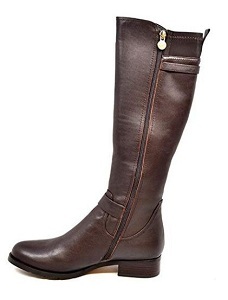 If you are looking for the superior quality narrow calf boots to purchase, the Franco Sarto Hydie women’s riding boots would no doubt be some of the best shoes to buy. The Ilana pull-on SHOVN are unique and elegantly designed western boots with a refined point-of-view. They are made of 100% leather materials that are comfortable on the feet and guarantee long-term durability. 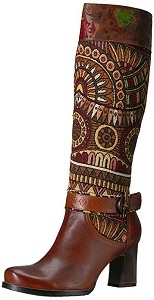 They are knee-high boots featuring beautiful decorative embroidery at the shaft and vamp. Their beautiful stitches together with the high stacked and unlined leather heels usually take the classic cowboy boots to an entirely new level. The leather is normally washed, oiled and then distressed in order to achieve a perfectly worn look. Their shafts usually measure about 15.5 inches from the arch, the heels measure about 3 inches while the boot opening is just about 14 inches round. Moreover the scalloped topline of the Ilana pull-on SHOVN boots usually comes with dual pull-on loops. Moreover, the normally come in a range of colors to choose from. Made using 100 percent leather materials, these are high quality suede shoes that are uniquely designed to deliver unmatched traction, comfort and durability. They normally feature an inside zipper & stretch goring which creates an easy on and off design. Moreover, they also have a technical microfiber antibacterial lining which usually helps in wicking away moisture. The 3 MM cushioned memory-foam insole offers extra padding that enhances your comfort when you are wearing the shoes. The shoes also have a TPR platform outsole which provides better traction and durability. They are stylish shoes with a waterproof design which makes them suitable for use in any weather, while their rich suede upper features a smooth profile and minimal lines with a timeless look. Their shaft measures just about 15.75 inches from the arch, the heels are approximately 3 inches, the platform is about 0.5-inch while the boot opening measures about 15.5 inches round. Whether you want to pull yourself into a saddle or you are heading to the city and are looking for the best boots to use, the Melissa Button 2 riding boots will no doubt be the best choice. They are fashionable and durable boots with a supple leather construction and have a tall shaft which makes them the best boots for you to stuff your favorite skinny jeans into. Whether you are looking for a heeled pair of boots or riding boots, what’s important is that you find a pair that fits your legs and feet properly. If you have skinny legs, that means finding a narrow calf option. Thankfully, we’ve done the leg work and compiled a list of the top narrow calf boots. No matter what you are looking for and what your budget entails, this list is sure to have a great option available for you!